By early 141 BC the Roman war in Hispania Ulteria against the Lusitanians, led by Viriathus, had been dragging on for nearly six years with little to show except a string of embarrasing defeats. Rome sent the Proconsul Quintus Fabius Maximus Servilianus, along with 18,000 foot and 1,600 horse, to finally deal with Viriathus. Servilianus was further reinforced with 300 horse and 10 elephants from the Numidian King Micipsa. 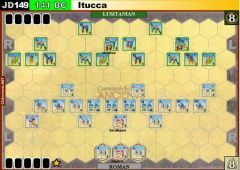 Confident in success, Servilianus marched his army west towards the town of Uticca, but his advanced units were ambushed by 6,000 Lusitanians. 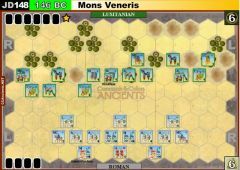 On this occasion the Romans held firm and drove their attackers off with little loss. When Servilianus had advanced beyond Itucca, Viriathus offered battle. The Lusitanians were routed, but the Romans became disorganised in their pursuit and Viriathus was able to rally his army and strike back. The Romans suffered 3,000 casualties and were driven back to their camp in disarry. They were only saved from destruction by the brave actions of a Roman Tribune named Fannius, who was able to rally a defence of the camp and hold back the Lusitanians. The Lusitanians now proceeded to harass the demoralised Romans day and night until Servilianus orded a retreat back to Itucca. Viriathus' army was also a spent force following the constant battles with the Romans in the vicinity of Itucca, and he too ordered his army to withdraw to Lusitania to rest and regroup. 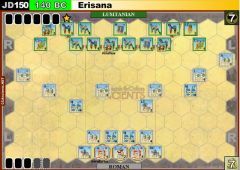 If a Lusitanian turn starts with that player possessing less victory banners than the Roman player, and Viriathus is still in play, then the Lusitanian player may declare 'Turn and Fight'. 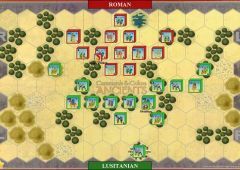 The Lusitanian player may randomly take a command card from the Roman player and add it to his/her hand, so that he/she now has 6 Command Cards for the rest of the game and the Roman player only 4 Command Cards . The Lusitanian player may now play a command card and all ordered units battle with +1 dice this turn. The Roman units and leader on the camp tiles may not move until 'Turn and Fight' described above has been declared.